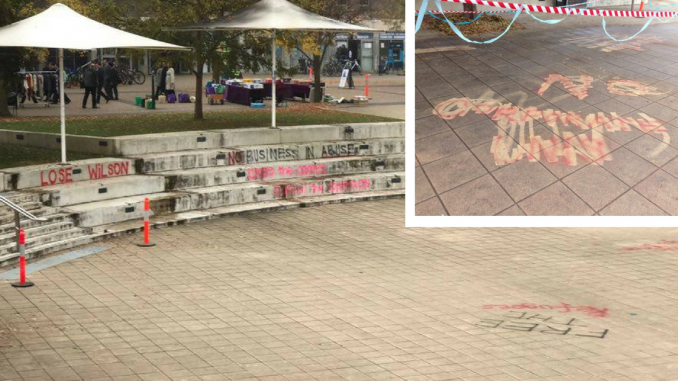 ANU activists painted pro-refugee, anti-ANU messages across Union Court last night, in advance of today’s farewell painting activities. 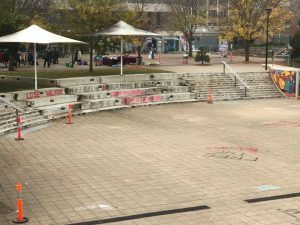 Their slogans, in protest of ANU hiring detention centre operators Wilson Security, were erased by ANU staff before the event occurred. “No Corporate Unis” painted last night. 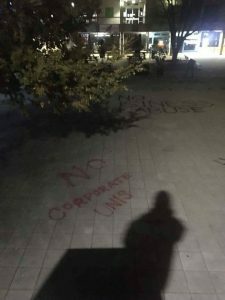 The painted slogans, including “NO CORPORATE UNIS”, “WE SEE THROUGH YOU BRIAN” and “FREE THE REFUGEES”, were painted by “ANU activists” according to a student present last night. The source claims they were not from ANUSA’s Refugee Action Committee, and the Committee denied any involvement in or awareness of the incident, although they stated they “support the messages”. The activists appear to be protesting Wilson Security, operators of the Manus Island and Nauru detention centres, who were contracted by ANU last year to provide campus security. This angered many students, and ANUSA condemned the decision. Wilson Security has since announced their intention to withdraw from the camps, but students remain angered. The protest messages were removed from Union Court with power-washers this morning, although the writing was still legible. 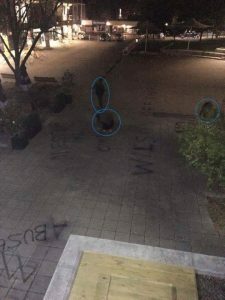 Vice Chancellor Brian Schmidt told Observer he “wasn’t convinced they had to take it off,” but that the decision to remove was made by someone else before he arrived. “It wasn’t my order” Schmidt said. ANUSA President James Connolly was lukewarm on the protest. “I think it was a fitting gesture of public speech” he said, but expressed concern for the ability of other students to be heard. “It dominated the space, and everyone should have space to leave their own messages … I’m a bit undecided” said the President. 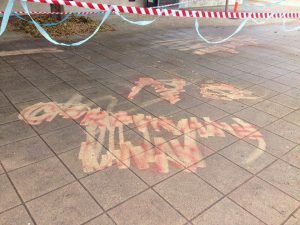 Various anti-ANU messages were painted during the event itself, including “I OPPOSE SCHMIDT’S REGIME”, and various messages from Fossil Free ANU. ANUSA Social Officer Cameron Allan said anything “obscene” would be removed, but made no comment on anti-ANU messages. ANU staff were present at the event censoring some content, but told Observer they were removing “mostly just a lot of dicks”.